Several fundamental practices maximize the accuracy performance when dynamically feeding bulk materials such as limestone or clinker. The following ‘weighing basics’ allow for extremely sensitive and reliable recognition for both material load and belt speed – the two fundamental measurements that provide accurate and repeatable gravimetric feeding. This is a function of the belt itself, the amount of inherent belt tension and the alignment of the weigh suspension. Such factors cause extraneous (non-material) forces from the belt to be transferred through to the scale and load reaction device, adversely affecting weighing accuracy. Most importantly, the point-of-contact interface between the conveyor belt and weigh suspension idler must be established, consistent and maintained. Belt selection: the choice of a proper feeder belt is the simplest part in developing an accurate weigh system. The desirable quality of a feeder belt should be a consistent weight over its entire length. Additionally, the belt should be sensitive enough to adequately transfer the forces of material loads to the scale. Similar material loading conditions must result in repeatable belt deflection. Therefore, the conveyor belt should be no heavier than is necessary. While thick belts can enhance belt life, beam strength is also increased which diminishes full material sensing. ‘Endless’ belts provide superior weighing performance over mechanically-spliced designs. The mechanical splice introduces a relatively rigid and dense section to the belt. This leads to an inconsistent weighing surface. Because the splice is inherently porous, material fines can fall through to the underside of the belt, increasing the chance of material build-up on the weigh suspension, possibly degrading the belt interface. Belt tension also increases as the splice travels around the feeder head and tail pulleys, adversely affecting the sensed material load. 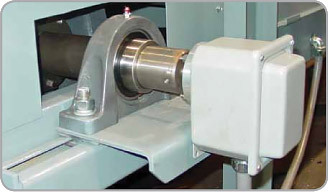 Belt tension factors: a weigh-belt feeder should have a minimized or ‘slack’ belt tension, just enough to eliminate belt slippage. Belt reaction error effects are amplified as the system belt tension increases. 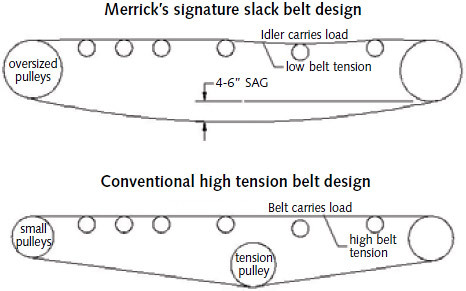 As a result, the slack belt concept provides for a superior long-term weighing environment. Additionally, feeder component wear is minimized. The amount of belt tension should also be consistent over time. Variable tension sources, such as a mechanical belt splice or mechanical belt tracking mechanism, adversely affect the belt/weigh suspension interface, leading to non-repeatable weighing performance. Belt slippage can be reliably avoided while maintaining the superior-weighing slack belt system. By using large-diameter pulleys, surface contact wrap is maximized. Additionally, a rubber-lagged head (driven) pulley enhances surface friction. Weigh Suspension Alignment: the weigh suspension transfers all material loading to the scale and load reactor. Additional belt reaction errors are caused by weigh suspension misalignment with the belt. The importance of a consistent point of contact between the belt and the weigh suspension cannot be overstated. Precise alignment is best accomplished by implementing trim screws for each idler in the weigh span. This allows for exact placement of the weigh suspension to the belt. Shimming should be avoided due to lower placement resolution and greater weigh span instability. Feeders require high structural integrity to provide for both long-term durability and weighing stability. This ensures that the load sensed by the weigh suspension is transferred to the load reaction device. The ideal scale will efficiently sum all material forces to the load reaction device, consistently and repeatably. There are two basic scale designs – the lever concept and the parallelogram principle. The very first dynamic weighers in the early 1900s used a lever scale. This mechanism is still used by most feeder manufacturers today. The lever operates on a simple fulcrum/pivot principle but it has two inherent shortcomings. First, the lever requires bearings and knife-edges that can be corrupted with material fines. Second, the lever can act in an unstable manner to asymmetric loadings, causing efficiency losses and non-repeatability. To specifically address the disadvantages of the lever-based scale, the parallelogram-style scale mechanism was developed in the 1980s. The parallelogram is actually two horizontal flexure plates which allow for only slight vertical deflection. Any torsional loading effects are minimized. This approach eliminates any moving parts and is virtually maintenance free. It is also more efficient as all forces, regardless of asymmetric belt loading, are maintained in the vertical dimension and consistently summed to one point – the load reaction device. Such devices are transducers that transform the sensed material load to a digital signal for the feeder’s control system. The transducer’s signal varies proportionally with the applied material load force. An ideal load transducer should provide zero deflection and extremely high resolution, while being very durable with no moving parts. Some feeder manufacturers provide proprietary transducers which offer only high resolution. But with modern analogue-to-digital technology now available in feeder control systems, the simple strain gauge load cell is the best choice among load reaction devices and has become the most common force-measuring device in use around the world. The load cell offers several advantages over other reaction device alternatives. First, the amount of deflection is the lowest among viable transducer technologies. This leads to the shortest-available stabilization time and more meaningful weight data. The strain gauge’s design inherently limits deflection and is not as susceptible to vibration from equipment such as nearby grinding mills. Unlike other transducers, the strain gauge load cell has a very robust construction with no moving parts. Temperature and barometric compensation is also available for robust load cell operation. Finally, the strain gauge is the low-cost solution alternative. The perceived disadvantage of the strain gauge has been its lower analogue-to-digital resolution (33,000 vs 1,024,000 counts). Yet, current advances in analogue-to-digital processors (24-bit A/D conversion) has allowed strain gauges to generate signals with over 16,000,000 counts of resolution. In fact, modern controls can actually target the usable resolution to ignore the ‘dead weight’ tare loads and focus nearly entirely on the live load. To most effectively feed gravimetrically, the generated weight component is processed along with a material speed signal to generate feed rate. Overall system accuracy and repeatability requires that the speed determination be of a reliable source and of sufficient resolution. The material speed generation signal is made up of a speed source and speed reaction device. There are several components that can represent the material’s speed as it travels through the feeder, the head pulley, tail pulley, tension roll or motor journal. Some feeder manufacturers prefer to use the driven head pulley or motor journal based on claims that the tail pulley is too dirty to effectively mount a speed reactor device. Yet, a fundamental sensing capability is lost, actual belt travel. Belt slippage or breakage can only be detected by placing the speed reaction device on a non-driven pulley. The best location to sense material speed is the non-driven tail pulley. The belt makes a 180° wrap around the tail pulley, ensuring maximum belt friction and minimal slippage. Therefore, the tail pulley only moves with the belt and material. Tension rolls, when used, usually have only 45-90° belt wrap and are more susceptible to slippage. The speed reaction device is generally a tachometer which is mounted directly onto the speed source. Digital or optical encoders are the most common tachometers used to measure the travel of the belt. Modern encoders are available in industrially-hardened enclosures which can operate reliably in the most hostile feeding environments. The available resolution of the tachometer is critical in the calculation of feed rate. The higher the resolution, the smaller the belt increment that can be measured. Modern tachometers should be able to discern a belt travel of approximately 1mm per pulse. Additionally, two channel encoders and special electronics in the feeder controller allow for ‘filtering out’ of speed pulses from the tachometer that represent backward travel of the belt due to oscillation or vibration. Therefore, only pulses that represent forward travel are transmitted. This eliminates any possible erroneous totalization based on negative belt travel. As a result, the material speed recognition system can be as accurate as possible. To ensure high performance in gravimetric feeding systems, there are several fundamental practices that must be followed. Accurate and repeatable feeding requires good derivation of both the weight and speed signals. By following these guidelines, feeder accuracies of ±0.25 percent of total delivered material weight can be easily achieved with repeatability of ±0.25 – 1.0 percent of set rate at 2-sigma.